The USB Power Delivery (PD) standard enables power delivery via USB up to 100 W, which is sufficient enough to drive high power rated devices like laptops, monitors and DLP® movie projectors. USB PD adapters traditionally use an inductor-inductor-capacitor (LLC) or quasi-resonant (QR) flyback for isolated DC/DC conversion. The benefit of an LLC is that it enables power switches with soft switching, but is not applicable at a wide output voltage range because of its narrow gain limitations. Meanwhile, a QR flyback operates in discontinuous current conduction mode and can’t achieve full soft switching at all output voltage ranges. Additionally, losses from the transformer leakage inductance limit the practical maximum switching frequency. These features set a tough ceiling when attempting to achieve high power density and small adapter size. Active clamp flyback (ACF) is a new resonant topology that can overcome these limitations. Unlike a QR flyback, ACF achieves soft switching and recovers leakage inductance energy. A critical-conduction-mode ACF uses a small negative magnetizing inductance to achieve zero voltage switching (ZVS) over the full load range. Also, the output rectifier can achieve zero current switching (ZCS) during turnoff, which will decrease the reverse-recovery loss of the rectifier and improve electromagnetic interference performance. With these advantages, a high-frequency and high-efficiency adapter becomes possible. The circuit in TI’s 30-W/in3, 93.4% efficiency, 100-W AC/DC adapter reference design consists of a front-end transition-mode power-factor-correction (PFC) circuit based on the UCC28056, followed by an ACF for isolated DC/DC conversion based on the UCC28780. Figure 1 is a detailed system block diagram of the reference design. The top feature for designers is the ultra-high power density 30 W/in3 without case. 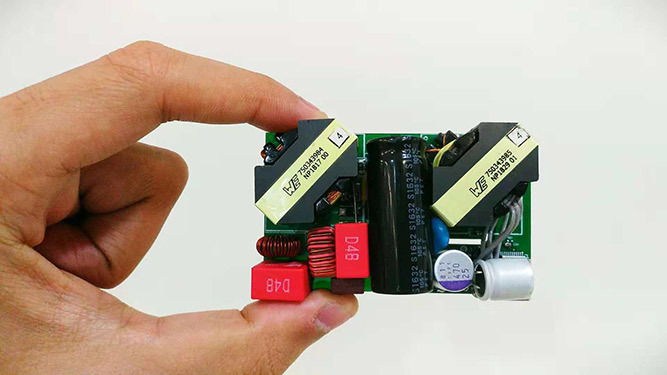 First, the critical-conduction-mode ACF makes high-switching-frequency operation possible, which allows an RM8 core to be used for the transformer And with ultra-high converter efficiency, there is no heat sink needed, which saves space and increases the power density further. Figure 2 is an image of the AC/DC adapter reference design board. Another key feature for designers is the high efficiency of this design. The UCC28780 achieves ZVS for the primary switches and ZCS for the secondary rectifier. The secondary-resonance configuration shapes the primary current waveform, which reduces the primary root-mean-square (RMS) current and improves synchronous rectifier operation significantly. Gallium nitride field-effect transistors are used for the ACF primary side switch to improve efficiency since they have smaller parasitic parameters. 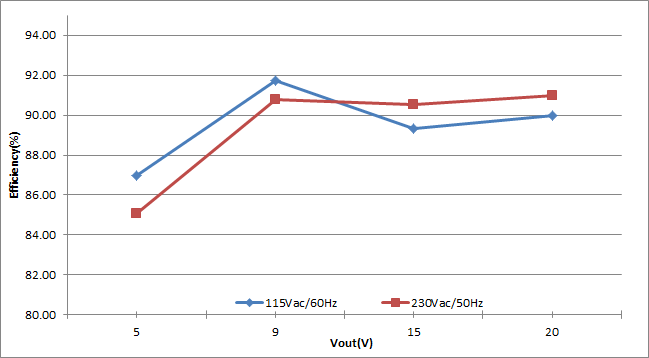 The efficiency is further improved by turning the PFC stage off at 5-VOUT and 9-VOUT. Figure 3 shows the average efficiency curve of the reference design. Overall, the 100-W AC/DC adapter reference design provides a total solution for a USB PD adapter, which could be applicable in any 100-W application. The high efficiency and power density make the adapter more powerful and more portable. Download the UCC28780 and the UCC28056 data sheets. Check out the 30-W/in3, 94% Efficiency, 65-W USB Type-C™ PD AC/DC Adapter Reference Design. Watch our video to learn more about how UCC28780 enables the ACF topology and achieves such high power density.